As we’ve been preparing to move, there is one item that keeps getting shuffled from one space to another: my bobbin lace pillow. A friend introduced me to bobbin lace in 2013. 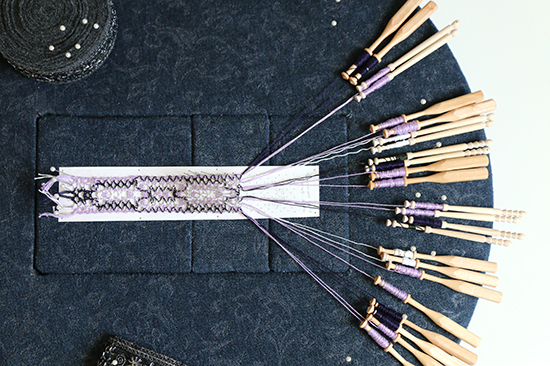 She has a home weaving business and bobbin lace is her creative outlet for personal projects. She was offering free lessons and a few of us took her up on them. What is bobbin lace? As the name implies, it is a type of handmade lace that is made from thread wound on bobbins. 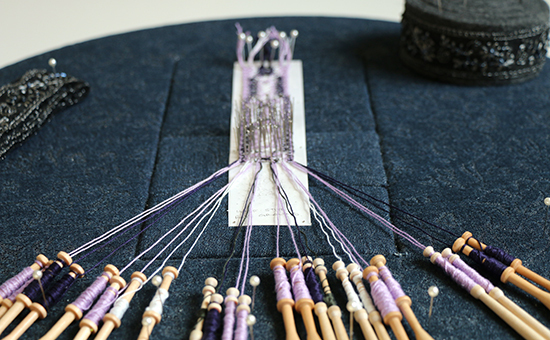 There are different styles of bobbin lace, hailing from different regions and time periods. She taught us one of the oldest but simplest styles, Torchon, which is based on geometric patterns with bobbins that usually move together in pairs. What does a pillow have to do with this? As the pattern is worked in one continuous piece, the lace is pinned onto a soft but firm surface. This surface also allows space for the bobbins to rest without getting mixed up. My round “cookie pillow” is about 20 inches across with a pincushion secured to the top that makes it about five inches tall, plus the requisite assortment of pins stuck into the surface; it’s not something that can be easily tucked onto a shelf or in a drawer. If it has to be out anyway, why not use it? One peek under the dust cover told me that I already had a bookmark project set up and ready to go; I’m still enough of a beginner that all of my projects so far have been bookmarks. The one catch was that I had already packed my related books and notes. The other catch, which I quickly recalled as I revisited the project, was that I had been struggling to learn a new-to-me design on this bookmark: Half-Stitch Rose Ground. After a week of working on the bookmark, undoing and redoing the work numerous times, it’s done! The color combination isn’t my favorite; I remember I was using up some scraps of thread when I chose the colors. If you look closely, you can see that the design isn’t quite right. By the end of the bookmark, though, I was finally making the Half-Stitch Rose Ground correctly and that’s what really counts. Learning doesn’t always equal perfection, a concept that I think we all struggle with at some point. The pillow is still out, with the same pattern pinned down. I picked up a few other thread colors so I can continue to improve my Half-Stitch Rose Ground skills as we wait for our house to sell. What types of projects do you find yourself shuffling around? Thanks, and I agree! I hadn't heard of it before I saw my friend making some lace projects.